Help us transform the lives of children in Detroit! The transformation of three abandoned lots into a safe place where children and their families can play, grow, and dream! The friends of Neinas are changing lives by changing those abandoned lots into a soccer field, a place for students to display art, and a place where the community can come together! The students, with the help of their teachers, have begun dreaming about all that those lots could be! 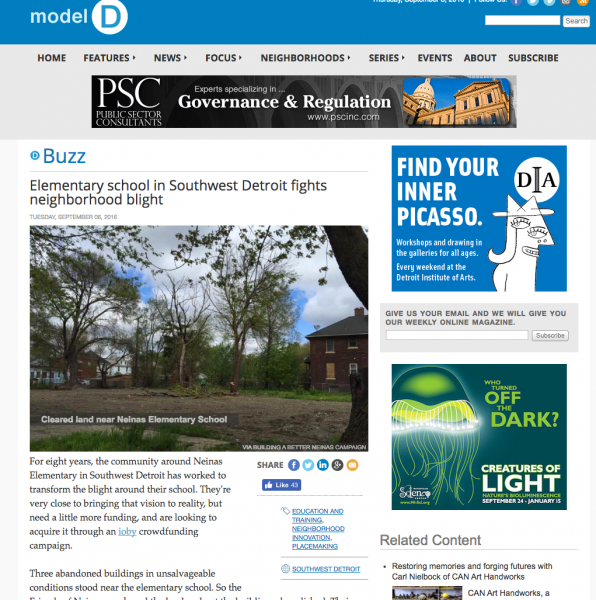 In the past eight years, the community around Neinas, the school, and parents have worked really hard to get three blighted buildings down that were not only an eye-sore to the neighborhood but a danger to the children. In 2015, a collaboration of people came together, and started planning all that those lots could be. The students started dreaming! The students took surveys, compiled that data, built models of their dreams, and presented to Universities and other donors. While all that happened, the Friends of Neinas, worked on being able to acquire land, put together budgets, and cut through red tape. The planning is complete and now we are ready to move forward with those plans! In order to make these dreams a reality for this community, we need $20,000! We are super thankful for all of your support thus far, you are all amazing! We are in the final 6 hours of our campaign and every $ raised right now is matched dollar for dollar. We are at 35% of our goal and raising more $$$ by the minute! The more we raise now the closer we are to providing a safe loving environment for kids where it was once a vacant blighted building! This project will definitely be a success because of all of these generous contributions. Check out and share this awesome article! And don't forget we've got a $1 for $1 match right now. So your generous gift will be doubled.